One of the rarest phrases I have heard in Cambodia is “Thank you”. I have literally provided millions of dollars of assistance to Cambodians over the last fifteen years. I can count the number of times that I have been told thank you. Partially it is a cultural issue, but mostly it is a matter of etiquette and politeness. To close friends, culturally, you should not say thank you, but to demonstrate your gratitude to them. 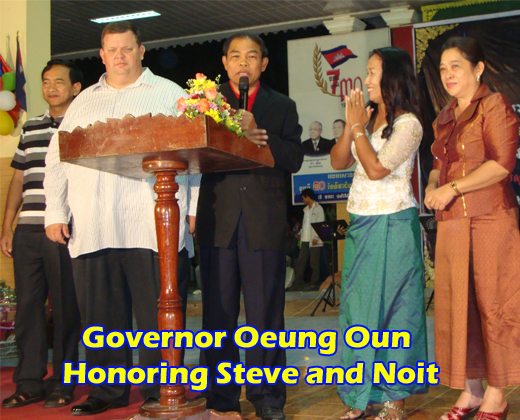 Governor Oeung Oun, for a second year in a row, has allowed Christians to publically celebrate Christmas and even presided over the ceremonies and concerts himself. In this staunch Buddhist country, this is an amazing display of freedom of religious expression. The program was planned and approved far in advance. One element of the program was showing our appreciation to the Governor and other officials. We presented the Governor and officials with special gifts. As my wife and I have had a great personal relationship with the Governor, we presented him with two mahogany wood vases with beautiful carvings. After the presentation ceremony, the Governor, in a spontaneous addition, asked for my wife and I to come forward surrounded by two deputy governors. Over the next five minutes he talked about how much Noit and I had done in the last year to help Banteay Meanchey province and repeatedly thanked us in front of the 7,000 people in the crowd. Publically he told everyone that we were currently building a new center to house and educate orphaned and abandoned children in Banteay Meanchey center. It was 80% complete and very soon we would be helping hundreds of children giving sacrificially to them. He also talked about me as being a professor and traveling around the world to teach and to highlight the needs of the people in Banteay Meanchey and so he was so grateful for my wife and I. It was very honoring for him to make such a public expression of gratitude in front of thousands of people, including hundreds of our personal friends. It is a good testimony to the people of the love of Jesus Christ being not only honored in heaven, but among the authorities of the world. Noit and I have never been able to do anything alone and have been dependent on the Holy Spirit to guide and direct us. As we have been faithful in doing what God calls us to do, so many dozens of our friends and supporters have made this moment possible. Thank you to all who have supported us in the ministry here in Cambodia, the fruit of the labor it quite significant that even the government would recognize it. Big smiles all around over here….